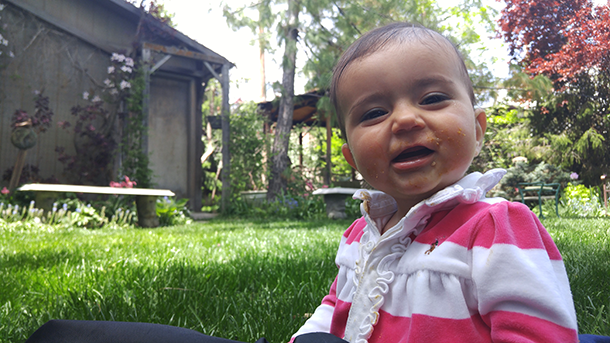 We lunched today in Grandma DeeDee’s garden. 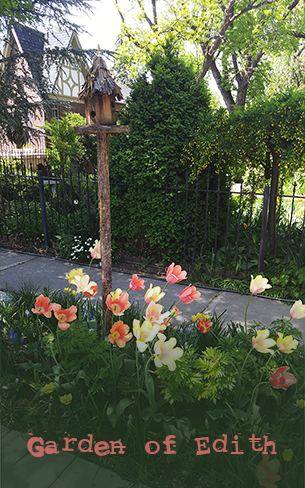 I wanted to see her latest project, the parking strip in the front where she replaced the sod with blooms and green, a bird bath, a bird house, a bench, and a path through the beauty. She told me about wanting to do this last year and I wished her luck. She’s only 98 so why not come up with a new project? As we pulled up to her house, Dom looked outside and saw her home, in spring bloom, and simply said, “whoa”. He climbed out and disappeared into her yard while I gathered our stuff and Gabbi. Eventually, he came back to find me and inform me that I needed to come with him. I needed to see all of the flowers. I needed to smell them all with him. He instructed me on how to smell them, leading by example, and watching me as I copied. We sat on a blanket on the lawn in the backyard, eating our PB&Js. Dom would give Grandma pieces of his crust and she would eat them, making faces at him, which made him giggle and laugh. “Eating the crusts will make your teeth strong,” she said. He picked off more crust and ate it himself, smiling at her. Later, she sat on a bench while Dom searched for potato bugs. Grandma told me about working on her project and how her sons helped her dig out roots, how she paid a boy that needed odd jobs to dig out the sod, and how she teaches piano to a family in her ward and they helped her afford the concrete pavers, bird bath, and bench because they owned the shop where she purchased them. 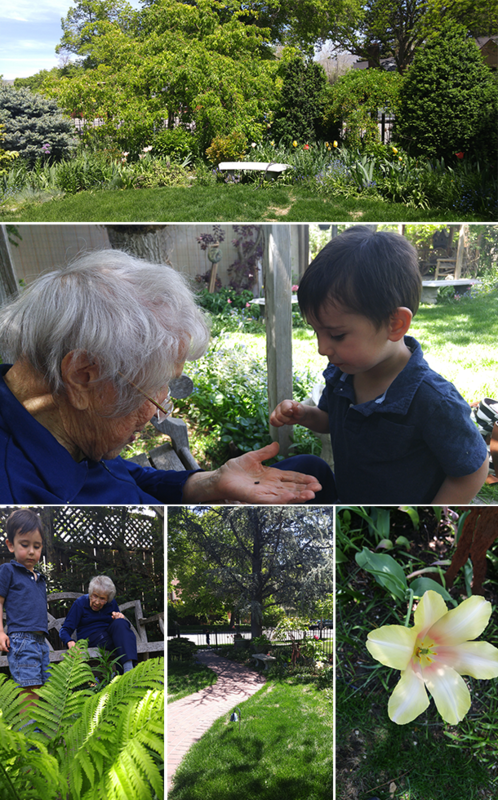 She explained how she and my uncle dug up peonies from the back, split the roots, and planted them throughout the front. The blooms were just about to pop open today. It was a group project. Grandma was the project manager. Turns out, nearly a century of experience and hard work makes you an excellent PM! She should be a consultant… in all of her spare time. I had to leave sooner than I wanted to get home for nap time. I only wish these cell phone pics were scratch and sniff. We gardened. Finally. And the outcome makes me happy. The best visual outcome so far is The Herb Wall. One day, we will repaint our patio. Until then, we will use some of the vertical space for growing herbs. Nathan tucked them in behind the raspberry bushes. One day, we will also get cool stepping stones leading up to them. For now, there’s a rubber mat. Crafty! The construction was super easy. I found these clips on Amazon: Flower Pot Klips. I put them on my wishlist some time back and then they went out of stock, so I was saddened. One day, I stopped back into Amazon to find, they were back! I bought them. I bought them and they aren’t even “Prime-able”. Ever since joining Amazon Prime, I pretty much only shop Prime eligible items, but I ponied up for the shipping and submitted my order. I am happy with the transaction. You can see one of the clips in the wall just above Nathan in the picture below. Once we marked out where to screw them in, he had them installed within a few minutes. I used some acrylic paint on the pots to label which herbs grew where, nothing fancy, just some black paint. 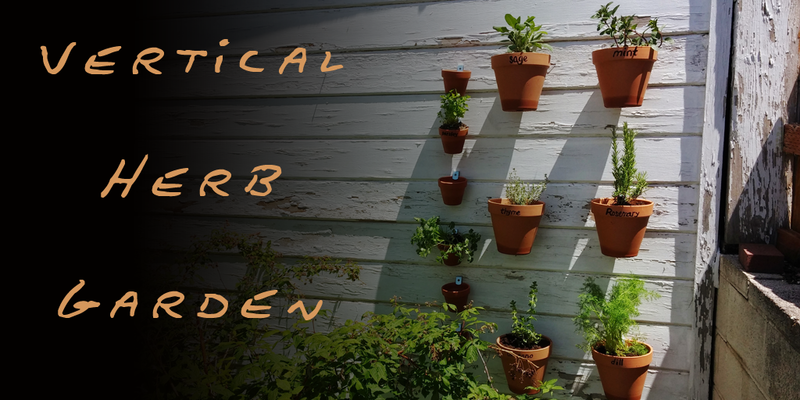 Once filled with dirt and the herbs, up onto the wall they went. Boom. Done! Looks great, though, right? We also set up the veggie boxes. I should have taken a picture of their terrifying state filled with towering weeds, but when I was digging those out, it was in the rain. (BTW, weeding in the rain is much easier than with dry soil so take advantage!) 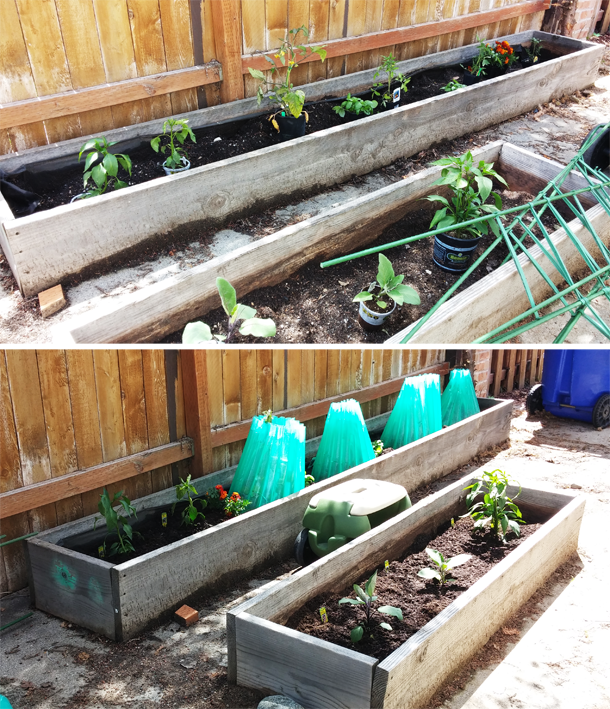 Between the weeds and digging out the top several inches of weedy soil, I filled up both of our garbage cans. Thankfully, the garbage truck still accepted them in spite of their weight. We bought tomatoes, different peppers, two types of eggplants, marigolds, and basil from Smith’s Marketplace. 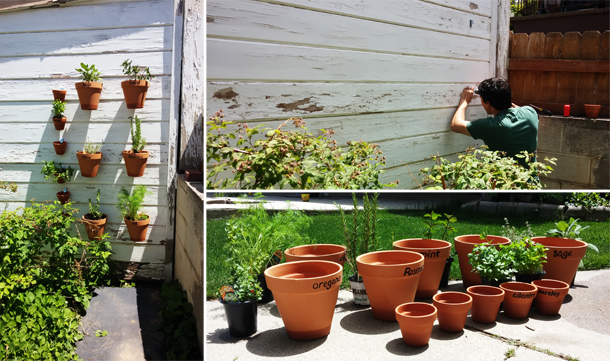 After filling the boxes with replacement soil, in the plants went and then the hard part: adding the Wall-o-waters. These little greenhouses protect tomatoes from the cold. We have six of them from last year, but only bought four tomato plants this year. It’s rather exhausting to fill them up because it’s AWKWARD. But now they’re up and the only thing to remember is to pull them off before the plants get too big (so we can save them for many more years). Both Dom and Pogi were our gardening helpers. 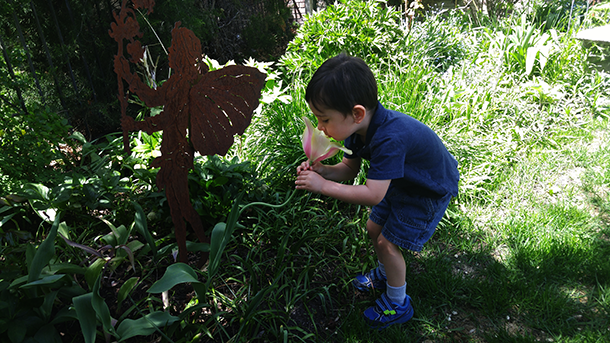 Dom spent much of his time hunting worms, which he tossed into the composter. Pogi spent his time eating grass and being afraid of the hummingbirds that buzzed him. 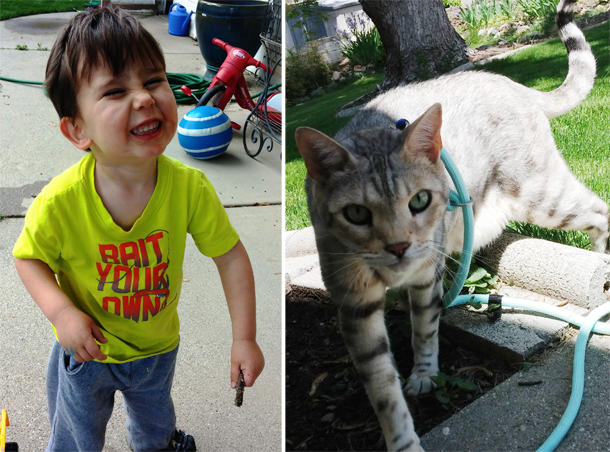 And yes, our cat is on a leash. We are those people. And on a last note, this wasn’t done this weekend, but it’s part of our garden so let me share! We planted peas weeks ago. Dom helped me and then helped water them and was excited to see them grow. As they got taller, I kept thinking that I needed to buy something for them to climb up. Or I could make something. Oooo. Novel. I realized there are these bamboo bushes (what are they really? dunno) growing on both sides of the pea section. 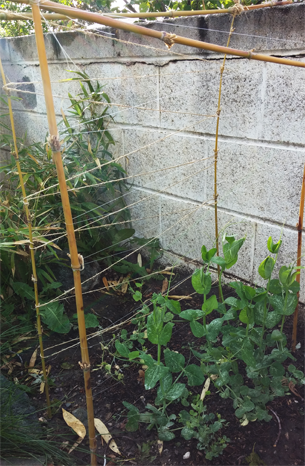 I took some loppers, cut off some of the thicker bamboo branches and made a couple of trellises for the peas. One trellis was made with fishing line because I couldn’t find our string. Then, I bought some twine and made the second one. The twine was far easier to tie up, so don’t do what I did: stay away from fishing line. Just use fishing line to scare away deer. We’ve also planted a bunch of other seeds, some are slowly growing, others, not so much. Maybe, just maybe, we will eventually have: lettuce, chard, kale, carrots and kholrabi. I was attempting to say, “version,” but I was also talking about “revisions”. My brain muddled them all up as I attempted to speak intelligently and professionally in a meeting at work. In the end, I spoke of “visions”. Tonight, Dom was trying to explain that he wanted something out of the freezer only he didn’t know that’s what we called it. It wasn’t the fridge. That’s the door with the cheese. He knew that much. So what’s that other section called? He thought for a minute and then told me, “the ice door”. Dom will be performing Twinkle, Twinkle, Little Star, words by Jane Taylor, music by some dead French guy. Grandma DeeDee always taught us to announce our songs for rehearsals and when we played in the festival up at the U. I think that those times may have been the only times that I ever enunciated my words as an adolescent. She also taught us that after we finished our piece that we should pause for a few seconds at the piano before getting up. I could use the reminder to enunciated and to pause. 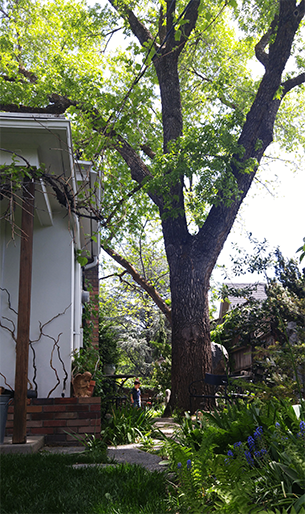 The blog has been a bit forgotten with busy busy busy work, running around outside for the last of our warm days, packing box after box after box, and getting things done at the new house like painting. We will eventually move in. We will sleep in our new rooms. We will watch the sunset from our new porch. But until then we sure seem to spend a lot of time in the car going between our place in Salt Lake, work next to Emigration Canyon, and the new house in Bountiful. Dom has kind of been a trouper with his transition into road warrior. 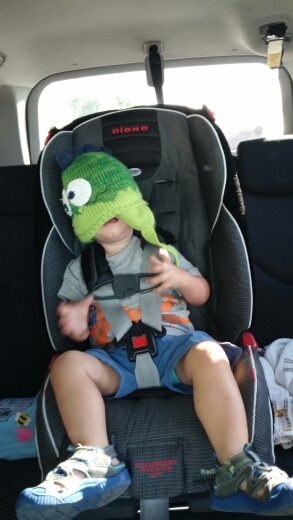 He spent one evening driving to the new house with his winter cap over his face. Dom and I knew that we would be on our own for dinner tonight because Dada (a.k.a. Chef Guapo) had Back to School Night. I may have forgotten how to cook in the 3+ years since getting married. I may have forgotten whether or not I DID cook when I was single. Snickers for dinner was once passable. I did my best to procrastinate figuring out dinner for us tonight by taking Dom to Back to School Night. When we got to the school, we followed the crowd of parents to the printed lists on the wall, posting teachers and their students. We looked for his name, but apparently, he wasn’t assigned to any grades. We wandered around to see if any of the teachers could possible take him, or even wanted to. We found two: the librarian and the science teacher. Dom won’t have home room, I guess. 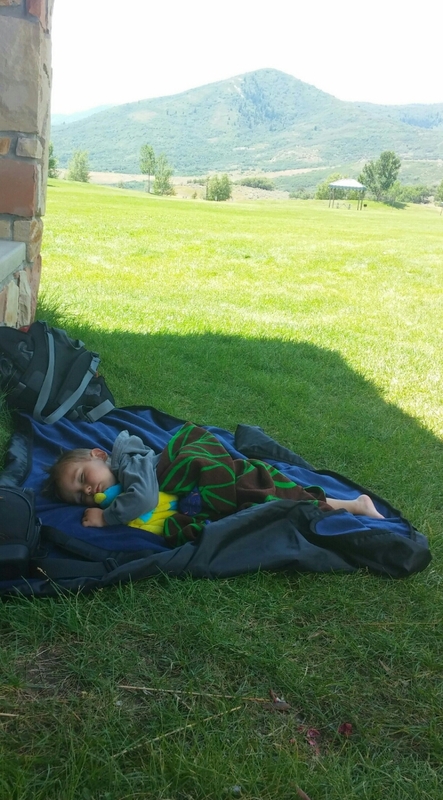 He tried out most of the beanbag chairs and carried a book of “peeeple” around with him. Eventually, I distracted him away from books and we sauntered down the hall to one of the last classrooms, assigned to a science teacher, Ms. Baldree. He ran into this room as well, which surprised me. I came around the corner and saw that he had found Dada in there. Big hugs all around. Dada then had to do some principal duties. Ms. Baldree set Dom up with some coloring and he was quite happy for hours. Well, “toddler hours”. It was excellent and then I had a chance to catch up with the teacher because she and I are friends from years back. It was a good evening. Dom saw his Dada at work and then we hit up some dinner at Paradise Bakery because I ran out of time to cook him something before bedtime.